14-year-old Julia Farrell practices with help from Dawn Crawford during a recent wheelchair tennis demonstration event at Evergreen Racquet Club in Bloomington. The crowd at the wheelchair tennis demonstration event. 14-year-old Julia Farrell in action at the wheelchair tennis demo. Julia Farrell traveled from DeKalb County to attend the wheelchair tennis event with her father, Kevin. As a current volunteer for the United States Tennis Association’s Midwest Diversity, Wheelchair and Adaptive Tennis program, Guess-Hanson decided to organize a wheelchair tennis demonstration event in Bloomington. Fifty people, some in wheelchairs, showed up last week at Evergreen Racquet Club. A team of four wheelchair tennis players and a coach traveled from western Indiana to show how wheelchair athletes can compete with their so-called “able bodied” colleagues, some of whom are teammates, others opponents. There have been wheelchair tennis players in Bloomington before. But Colleen Curran, Evergreen Racquet Club’s general manager, said this demonstration event marks a turning point for the club. Participation by athletes in wheelchairs has skyrocketed worldwide, increasing 11-fold since fewer than 400 took part in the 1964 Tokyo Olympics. According to Paralympic.org, there were nearly 4,300 wheelchair athletes at the London Olympics in 2012 and about 4,350 at Rio in 2016. The sport of wheelchair tennis was the brainchild of Californian Brad Parks, who worked with friends to establish a competitive program after a skiing accident left him paralyzed from the hips down. “In 1980, four years after my accident, we started this national organization to promote wheelchair tennis and get more people to know about it and just give it a shot to see if you can develop a sport from nothing, and it kind of grew into what it is today,” Parks said. Today, there are more than 50,000 wheelchair tennis players around the world. In addition to the Paralympic games, there are wheelchair championships associated with all four grand slam tennis tournaments. Parks is among the most decorated wheelchair tennis players ever, holding the sports’ No. 1 ranking during the 80s, and winning three Grand Slam titles and a gold medal at the 1992 Barcelona Paralympics. “When we started the sport we felt like, how do we tell the people about a sport they’ve never heard of? Most people think it’s impossible to play, back in those days. So, the best way to do that is through these demonstrations. You get a couple of great players, they demonstrate, maybe help out with a clinic, and you teach people how to play and that’s how the sport grows, so I think they are critical,” Parks said. There are nearly 200 competitive events worldwide that regularly include U.S. professional players. Jason Allen, who heads up wheelchair tennis for the USTA, said one reason is—besides using wheelchairs—the game doesn’t change much. This slight rule variation allows wheelchair athletes to compete on the same court and in the same match as able-bodied players. Sherri Hildebrand is an instructional assistant professor in therapeutic recreation at Illinois State University and helped organize the demonstration event. She said the smooth integration of wheelchair players makes the sport inclusive. Julia Farrell has spina bifida, a birth defect where there is incomplete closing of the backbone and membranes around the spinal cord. Her dad said it limits her mobility. During the recent event at Evergreen Racquet Club, 14-year-old Julia Farrell tinkered on her phone while her dad, Kevin, drove the 88 miles to Bloomington from Hinckley in DeKalb County. Kevin Farrell said Julia has spina bifida, a birth defect where there is incomplete closing of the backbone and membranes around the spinal cord. He said it limits her mobility. “But here with the wheelchair, she can be like anybody else and play like anybody else because she’s very strong and she’s very coordinated,” Kevin said. 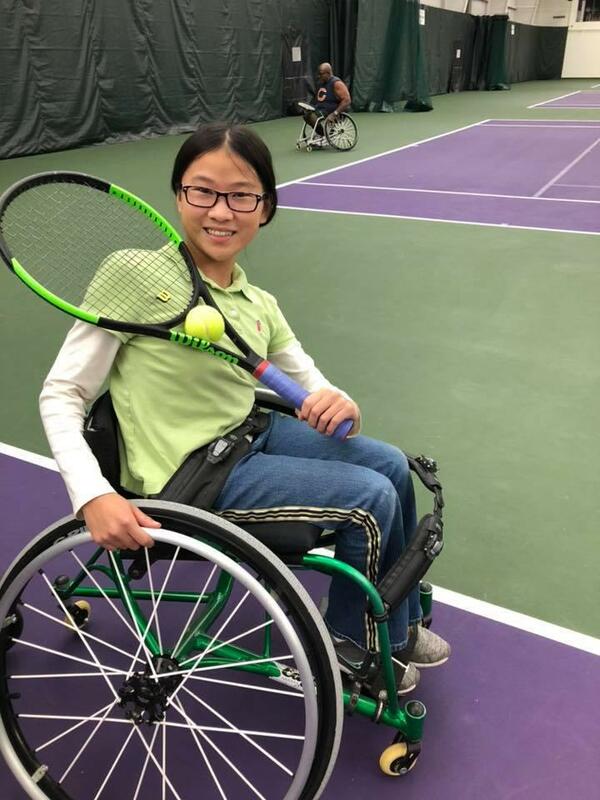 One of the demonstration team players let Julia borrow her wheelchair while running the 14-year-old through a set of basic drills. Dawn Crawford of Schererville, Indiana, suffered a spinal cord injury from a fall in 2000. She started playing wheelchair tennis about 10 years ago as a way to enjoy sports with her kids. Crawford said Julia seemed a natural for the sport because she’s so well coordinated. “She cannot move well, so for her to be in a wheelchair playing tennis would be better. She won’t get any balls standing. So, if she’s in a chair, she has to learn the movement of the chair, and she combines that with the strokes that she knows, she’s on her way,” Crawford said. Julia’s dad Kevin, who has taught tennis, wonders about things like wheelchair costs and access to programs and other players. But Dawn Crawford said grants can help pay for equipment, and if Julia wants to play with just about anybody else, there’s nothing to stop her. “There are players out there that have started young, and played from say her age on, and they’ve played on their high school teams as a wheelchair player against able-bodied kids. So it is possible,” Crawford said. Some observers of wheelchair tennis say the players’ ability to compete on a court with able-bodied athletes inspires them. But demonstration team coach Julie Fritz said some wheelchair athletes take exception to that notion. Parks, the wheelchair tennis founder, agrees with that to a point. But he said it’s only natural that great athletes are inspirational, especially when they’ve endured so much. “Some people watch the Olympics because of the up close and personals, and the up close and personals in the Paralympics are so much better and so much more interesting and inspiring because of what these athletes have been through,” Parks said. Volunteers and athletes at the recent wheelchair tennis event at Evergreen Racquet Club. Right now, funding and other issues have put the United States behind other nations in competitive wheelchair tennis, but Parks says he’s hopeful that will change soon. Organizers say they’re hopeful this successful demonstration in Bloomington could lead to more events like it, helping spread awareness—and the growth—of wheelchair tennis. Hundreds of wheelchair tennis players of all skill levels are expected to compete at this weekend’s Wheelchair Tennis Camp at Purdue University on Nov. 8-11. A professor who has studied recreational sports is raising concern that club sports are limiting opportunities for some young people in ways that can present a lifetime of negative consequences. Alan “Madfeet” Higgins entered into an elite group Sunday in Springfield when he completed his 26.2-mile marathon run.